The interest in `biomarkers' seen across a spectrum of biomedical disciplines reflects the rise of molecular biology and genetics. A host of `omics' disciplines in addition to genomics, marked by multidimensional data and complex analyses, and enabled by bioinformatics, have pushed the trajectory of biomarker development even further. They have also made more tractable the complex mappings of genotypes to phenotypes - genome-to-phenome mapping - to which the concept of a biomarker is central. Genomic investigations of the brain are beginning to reveal spectacular associations between genes and neural systems. Neural and cognitive phenomics are considered a necessary complement to genomics of the brain. Other major omics developments such as connectomics, the comprehensive mapping of neurons and neural networks, are heralding brain maps of unprecedented detail. Such developments are defining a new era of brain science. And in this new research environment, neural systems and cognitive operations are pressed for new kinds of definitions - that facilitate brain-behavioral alignment in an omics operating environment. This volume explores the topic of markers framed around the constructs of cognitive and neural systems. `Neurophenotype' is a term adopted to describe a neural or cognitive marker that can be scientifically described within an associative framework - and while the genome-to-phenome framework is the most recognized of these, epigenetics and non-gene-regulated neural dynamics also suggest other frameworks. In either case, the term neurophenotype defines operational constructs of brain-behavioral domains that serve the integration of these domains with neuroscientific and omics models of the brain. The topic is critically important to psychiatry and neuropsychology: Neurophenotypes offer a `format' and a `language' by which psychiatry and neuropsychology can be in step with the brain sciences. They also bring a new challenge to the clinical neurosciences in terms of construct validation and refinement. 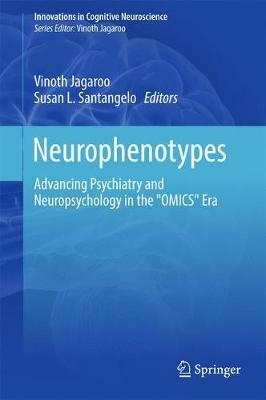 The volume may be especially relevant to researchers and clinical practitioners in psychiatry and neuropsychology and to cognitive neuroscientists interested in the intersection of neuroscience with genomics, phenomics and other omics disciplines.